February | 2010 | "How Would You Fix...?" …the outcome of the Celestial Messiah saga? During Fantastic Four #323, written by Steve Englehart, the Cotati deemed they were the only ones fit to raise the Celestial Messiah, and thusly removed the powers his mother Mantis had bestowed upon her when she became the Celestial Madonna, stealing away the pod that was their offspring. The High Cotati travelled within a pyramid to Earth, standing alongside Kang and revealing the pod that would become the Celestial Messiah. They asked Mantis to cease her vendetta to reclaim her son. She refused, and a battle involving Mantis and the Fantastic Four against the Priests of Pama and Kang ensued. The High Cotati, unable to stand up to Mantis’ mental assault, fuelled by her burning desire to be reunited with her son, fled with pod supposedly to their chosen realm, a realm of pure thought. 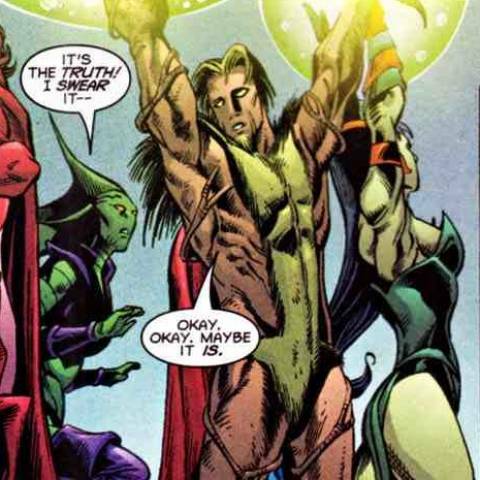 Despite Steve’s later revelation, during Avengers: Celestial Quest #2, that they had in fact taken him to the planet Tamal, I suspect that had he not been forced off West Coast Avengers he would reveal that the Cotati had NOT returned with the pod to their chosen realm, but rather engaged the services of Immortus, with whom they had a covert alliance, to deliver the pod back in time a few years. Otherwise, why else form an alliance with a Master of Time unless you’re going to request use of his time-travel abilities! I would posit that the Cotati had Immortus deliver the pod into the hands of the scientific complex called The Beehive. What I’m suggesting here is that the cocoon Him awoke from was not a chrysalis, as previously explained, but instead a seed pod. …who was destined to change the universe! I would reveal that Mantis’s son, Quoi, would go on to become Adam Warlock, and his destiny as a force for ‘Life’ to defeat Thanos, the champion of Death, further explains why the Cotati had been active on Titan for so long. This might further explain the matter of Mar-vell and Rick Jones encountering a temple of the Universal Church on Kree-Lar toward the end of Englehart’s run on that title, in Captain Marvel #41, a location previously dotted with Cotati temples. Was this meant to suggest that Adam’s devolution into the Magus began altering events backwards in time, and temples previously established for worship of the Celestial Messiah were being transformed as a subtle indication of this? If Quoi fell into the wrong hands, would he grow up to be the flipside of Adam Warlock, the Magus? the ending of Steve Englehart’s “The Occult History of America” storyline? During the 1970’s Steve Englehart began a time-travel story in which Dr. Strange meets a variety of historical figures including Sir Francis Bacon, whom he revealed not only as having been assigned to choose the Englishmen who colonised the “New World,” but as a telepath and the leader of a secret society of English and European elites, the later leader of whom would become Benjamin Franklin. “The Occult History of America”, as the story was titled, was written by Englehart for two issues before his deteriorating relationship with Marvel forced him off the book and Marv Wolfman was brought in to finish the storyline in a way that didn’t use Steve’s ideas. So what were Englehart’s intended ideas for remainder of “the secret occult history of America” storyline? I’m not sure, but it is interesting that in real life, Benjamin Franklin was infamously associated with the Irish Hellfire Club. So why not in the Marvel Universe proper?! I would reveal that the initial colony that Francis Bacon was said, in Englehart’s two issues, to have handpicked candidates for, were mutants shipped out of Britain to secretly avoid persecution, since the “secret society” that was the Hellfire Club realised the existence of such beings becoming public knowledge would result in another break-out of witch-hunts, what with their opponent King James acceding the throne. With all this talk of “secret societies” I would further reveal those Bacon handpicked to settle the “New World” as the Roanoke Colony and that the colony of New Salem are not the “witches” they proclaim to be, but rather the remainder of the Roanoke “mutant” colony. Their reason for not admitting to being mutants is a result of their having experienced the dark times for mutantkind, and fear of again being persecuted. I would suggest this is why the Scarlet Witch approached Agatha Harkness for tutelage in the use of magical energy, despite the fact that her ability to channel it existed as a result of her mutant powers. How else would Agatha know how to train someone in the use of their powers if its basis was due to their mutation? I would reveal that Agatha Harkness was able to assist Wanda due to herself also being a mutant… as are the colony of New Salemites. Their being mutants would better explain why all of the town’s inhabitants have powers, and would better explain why Reed and Susan chose Ms. Harkness as Franklin’s governess. That is, it made no sense why they would choose someone who was a practitioner in black magic, when the origin of Franklin’s ability was due to his being a mutant. However, with Reed and Sue’s knowledge of the emerging prejudice towards mutants at the time, they would have been reluctant to enrol their son in Xavier’s School for Gifted Youngsters. 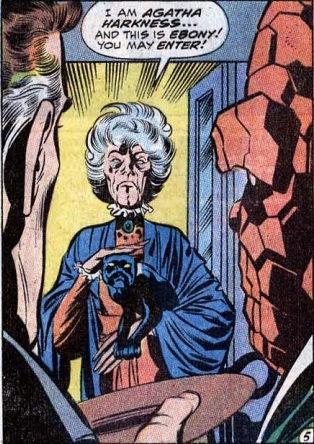 But if Agatha was secretly a mutant, she would seem a sound choice, since not only would she have the required skills to train a being of Franklin’s potential, but she would realise the importance of keeping his mutant nature a secret, after having first-hand knowledge of humanity’s prejudicial nature towards mutants. This could provide a more conclusive explanation for what Agatha was doing mixing it up with the ancestors of the Hellfire Club in that mini from a few years ago. That… and I would love to perhaps make Agatha analogous to the missing Virginia Dare. Now, why on Earth a writer of Neil Gaiman’s calibre never took this approach when he wrote his “1602” series, I’ll never understand, since Agatha would have fitted his “no character created after 1969 will appear in 1602” rule, perfectly.